This term in P7 has started off with an exciting tour around the world with our own Guitar Hero bands. So far we have visited Europe, Asia, Oceania and we still have North and South America left to visit. We are all starting to feel a little jet lagged!!! Plus we are all living the dream by wearing our own tour t-shirts which we designed ourselves. Our amazing novel study – Holes by Louis Sachar – has got us all sitting on the edge of our seats with all its exciting twists and turns! we are hoping to watch the DVD in the last week of term too. P7 rocks!!! In P7, we are doing a project on Guitar Hero. We have made our own bands with names such as the Devils Friendz, the Buzz Kicz, Thunder n’ Lightning and Skullz. We have also made band merchandise including t-shirts, keyrings and CDs. In writing, we have written biographies for our band characters, flyers for our gigs, newspaper articles and our own lyrics! Mr Johnstone from Lasswade High has been helping us with rhyme and pattern. We have also designed and created our own guitars. Also, we have been reading a novel with Mrs Stevenson called Holes by Louis Sachar and we have been doing lots of activities about it. Early Wednesday morning, P6 will leave by coach to travel to Robinwood Residential Centre for three days of exciting but tiring outdoor activities; such as the Giant Swing which Lewis Hanley thinks will be screamingly funny! Especially for the instructors watching them on their first time. Alena Asif thinks the Archery activity will test her strength and her aim. Canoeing takes a lot of cooperation says Katy Richardson, especially if you want to win the races. The Piranha pool is always a firm favourite of the pupils, even though the water tends to be a bit cool. Luckily the teachers are allowed to watch this activity. Flying through the air is how Emma Dickson imagines the Zip-wire should be. Miss Garraway can recommend this one and the climbing wall! Caving attracts a lot of interest from many in the class. Jasmine is really looking forward to the trapeze, but it is not for the faint hearted! Charlie, among others, is looking forward to attempting new activities, enjoying herself and working with others in her team. The instructors are fun and hard-working with lots of enthusiasm and encourage all in their teams to give all the activities a shot. When they return on Friday afternoon, there will be many tired but excited pupils coming off the bus. Good luck to them all! P2 had a very green Eco day on Thursday 22nd September. We talked about foods which are grown locally and in Scotland. We looked carefully in our pack lunch boxes which we had brought for the One Planet Picnic. We decided that it was a good idea to wrap food in reusable tin foil or use plastic boxes which could be washed and used again. Lots of children had healthy lunches with cheese and grapes being very popular! Children voted for the picnic which they felt was the most Eco friendly. 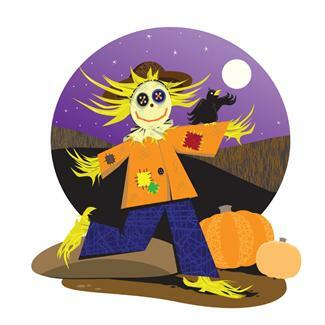 We had fun reading the story of ‘Tattybogle’ the Scottish scarecrow. Then we painted him. Finally we sang an Eco song and nominated our first Eco monitors of the year. We decided that our Eco monitors would remind everyone to put away any litter, recycle paper, empty the recycling bin and shut down our computers at the end of every day to save electricity. As part of our ongoing Eco Schools work and preparation this session to achieve our 3rd Green Flag, we will be holding an Eco ‘One Planet’ Picnic on Thursday 22nd September. Pupils at all stages of our school will be learning more about the types of foods which can be found locally and around Scotland, linking to work on both Health and Wellbeing and Sustainability.Please see the attached letter for the full story and changes to Thursdays lunch menu for the picnic. Please see the attached newsletter from P2 on how they have started the new school year. A couple of years back some trees were planted in school so we could grow our own fruit – we have apple, pear and cherry trees. 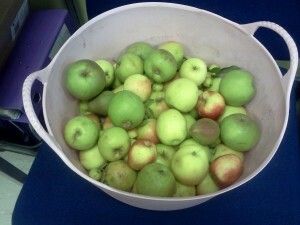 We now have some fruit on the trees and this basket of apples have just been picked. Mrs Campbell is going to make something very tasty with them in the cookery lessons. Well done to all the gardeners. P6 have settled down well into their new class and area. 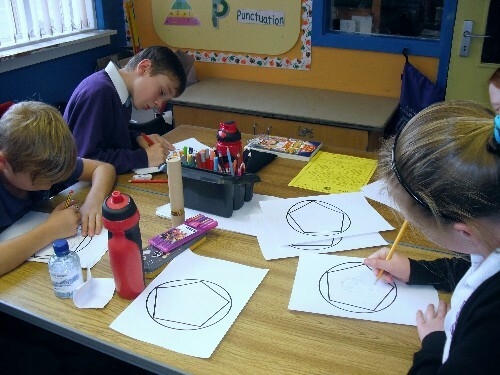 Cooperative learning strategies are an important part of the curriculum and to support this, all the P6 pupils formed home teams for a challenge on Wednesday afternoon. 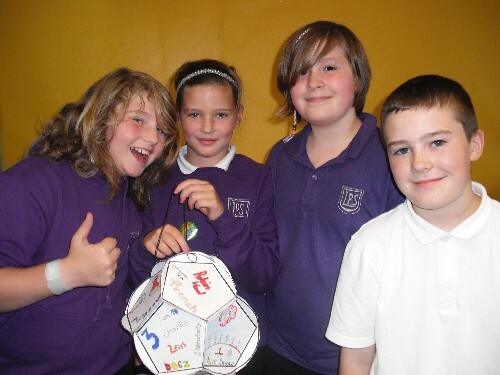 Their challenge was to work cooperatively together to create a dodecahedron, which had to include some personal information, their hopes for this session and their achievements. Time limits were given and most groups managed to complete their task on time. These will be displayed in the areas. Come along to Meet the Teacher and see their work! P3X have enjoyed an excellent start to the session. Mrs Doyle has been impressed with how quickly the children are learning the class routines and already showing greater personal responsibility. Everyone in the class has managed to ‘stay on green’ during their first week and handed in their completed homework on time – many thanks to parents for their support. We have been looking at the Rights of the Child and will be deciding which rights are important for our learning and life at Lasswade. These rights will form thebasis of our Class Charter – which is made up of both pupils and teachers Rights and Responsibilities. Then we shall begin the exciting topic of Pirates and Islands…..